I can safely say that a workbench is one of the most important parts of your garage or your workshop. When it comes to a good workbench, it should be heavy enough that it doesn’t shift when you are working on it. It also should be strong enough to take the abuse it will surely endure! You can either buy a workbench online, or you can create one on your own. 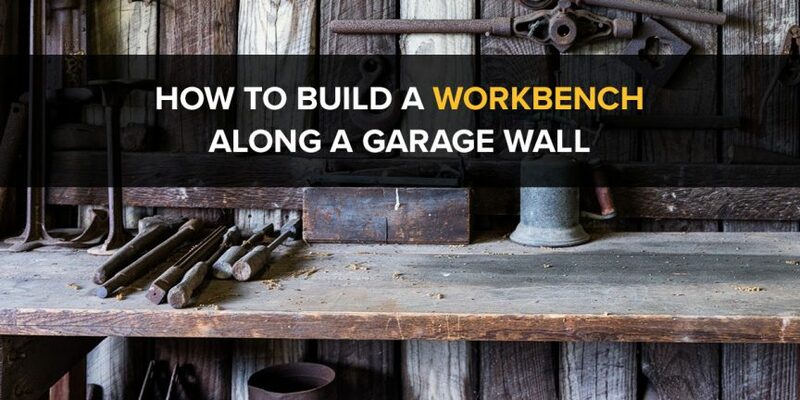 Building your own workbench along your garage wall is a good option as you can make the most of your space in a custom fit way. So, let’s talk about how to build a workbench along garage wall! Check the floor level to decide if you need to sand off any of the workbench legs so that it doesn’t wobble. Decide the best height of your workbench depending on your height. You don’t want to keep bending over your workbench for long hours as it will give you neck ache and backache. When you are assembling the support for the bench tops and the frames make sure you use proper galvanized decking or structural screws. Ensure that the wall of your garage (that you will be setting the workbench along) is not near the door of the garage as it may get scraped when you use your car. Think about any other potential issues like this. If you want to make a workbench out of 2x4s, you can cut the wood for the sides and the legs. The best thing to do for the shelves and the top is to use plywood. You can then screw together the side frames and make them in a square shape. You can then put the entire frame together and then fasten the top of the workbench (that you will make out of plywood) in place. You will then need to cut notches in the corners so that you can install the shelves. You can use 2×4 for the legs of the bench and for the horizontal structure that you will use to support the OSB tops, the plywood, and the shelves. It is always good to overlap the horizontal boards where the legs intersect. You can overlap the boards and then secure them with deck screws or with nails. When two boards which have a fair amount of width are overlapped and when they are joined well, they will form a connection which is very tight. This connection ensures that there is no movement when you move or bump the workbench with tools. You should always use 2×4 when you are making the legs and the shelf units for the workbench. Some people use 2×2 when it comes to the horizontal supports or the legs but the problem with 2×2 is that is doesn’t have the strength to form a solid connection, nor is it wide enough. Here’s a nice basic wall-mounted workbench approach. There’s always a few different ways to do things and this is just one way of doing it, but it shows how simple it really can be! And lastly, here’s another 2×4 workbench… but one that can be portable! Now that you know how to make a workbench for your garage, let’s see how you can add drawers to your workbench. To add the drawers to your bench, you will need to remove the cross brace that is in the front middle. You can cut it off using a saw. You don’t need to cut the middle brace that is at the rear. You can then add short braces of 2 inches x 4 inches under the rear and the front cross braces. This will give support to the drawers. You will now need to cut the opening in the front as per the size of the drawers that you need. Next, you will need to build the box frame for each drawer. You will have to assemble the faceplates and pieces for the drawer. Once you have the front and back pieces and the sides and bottom ready, make sure that the box is square. You then need to make sure that the sides are parallel to each other. You can then use wood screws, nails, or wallboard screws to attach the pieces to each other. Make sure that the drawers are not too wide as they will bind and you also need to make sure that the drawers are not too narrow as there will be too much play. Now, here’s a super simple way to make some drawers. I’ve seen really fancy and polished drawers that can be made… but it might be out of reach for the average person. But I feel most people could do something like this! 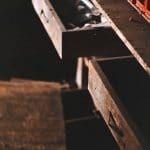 When it comes to the top covering of a workbench, almost any sheet of wood or lumber can be used. Garage benches don’t have any specific job, and can be used for many different things. Most of the time a workbench in the garage is used to store tools. In case there are some repairs in the house that you may need to do, you may choose to do it on your workbench. It’s best to have a workbench that is tough and rugged so that you don’t have to worry about any heavy tool breaking it. You can use a 2 inch by 6-inch standard lumber or plywood and keep it side by side so that the top is covered. You can then cut off the extra wood. This top covering will be able to carry load easily and will be heavy enough so that you can attach any tool that is bench-mounted like a vise or a grinder. Okay, so maybe you’re short on time. Or maybe you’re not confident doing a DIY project like this yet. For people like you, you might like something like this! These are both very well rated and solid options! Now that you have some great tips on how to create a garage workbench, go forth and build the best one you can! And if you do, we’d love to see it. Comment below if you have a garage workbench you’d like to show off!